Like other lepiotoid mushrooms, Lepiota magnispora has a white spore print and gills that are free from the stem. 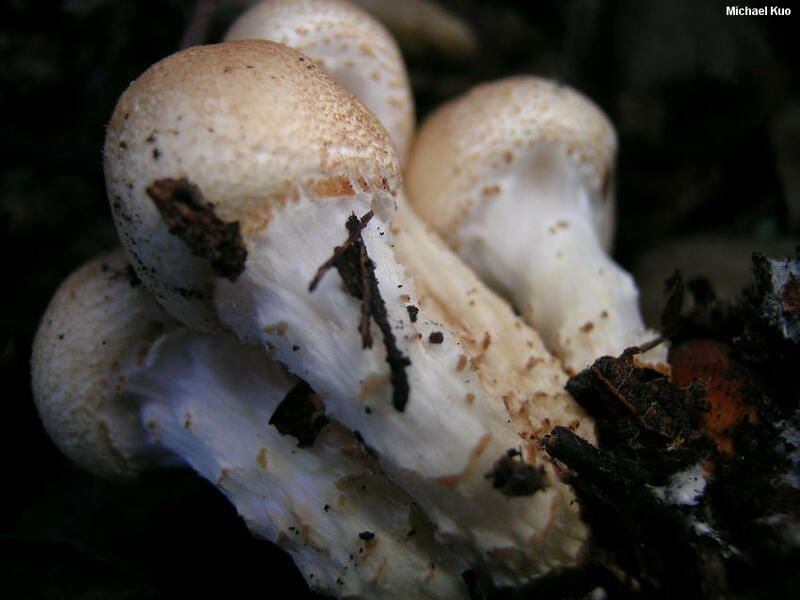 It is similar to the better-known Lepiota clypeolaria; both species feature shaggy caps and stems that are sheathed with shagginess. Lepiota magnispora, however, has brighter, yellower colors and a more contrasting "eye" in the center of the cap, as well as longer spores that are flattened on the abaxial side (the side opposite the direction the apiculus points). 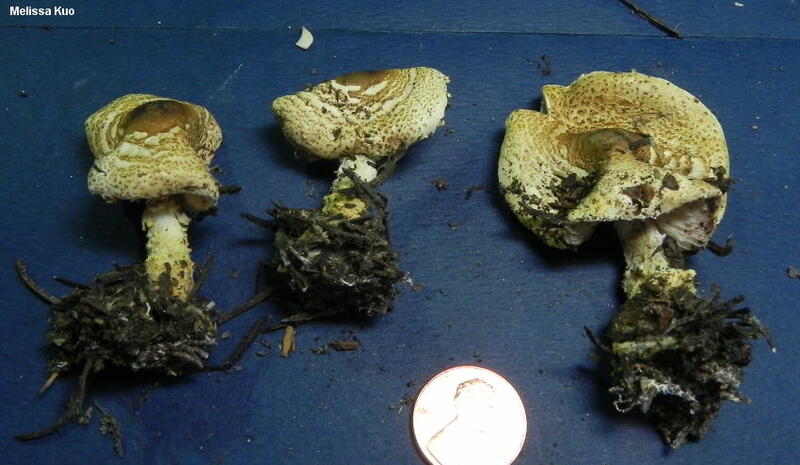 The North American range of Lepiota magnispora is uncertain, due to confusion with Lepiota clypeolaria and with Lepiota species 01. 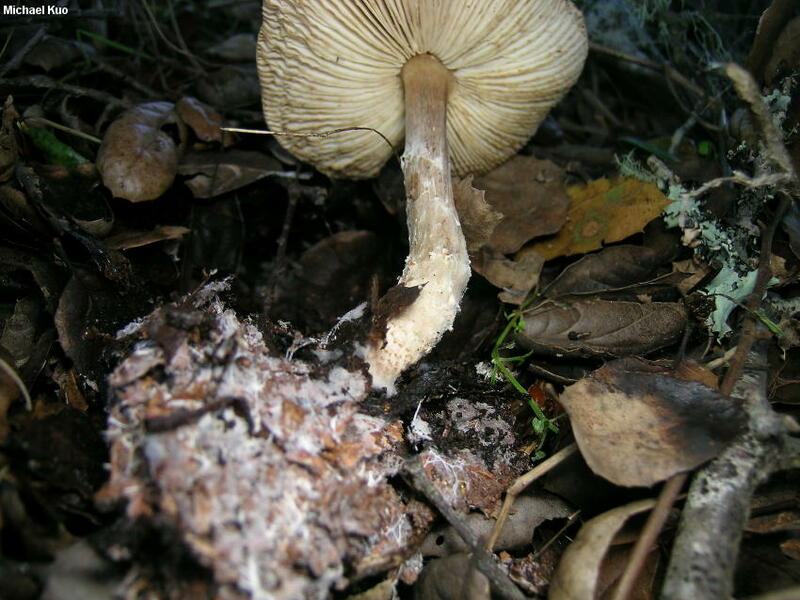 Ecology: Saprobic; growing scattered, gregariously, or in clusters in forest litter; found under hardwoods and conifers; summer and fall (over winter in coastal California); North American distribution uncertain. The illustrated and described collections are from California and Colorado. Cap: 4-7 cm; convex at first, becoming broadly convex to broadly bell-shaped or nearly flat in age; dry; finely fibrillose-scaly; yellow-brown to rusty brown, with a darker, contrasting center; the margin sometimes hung with a few wisps of veil remnants. 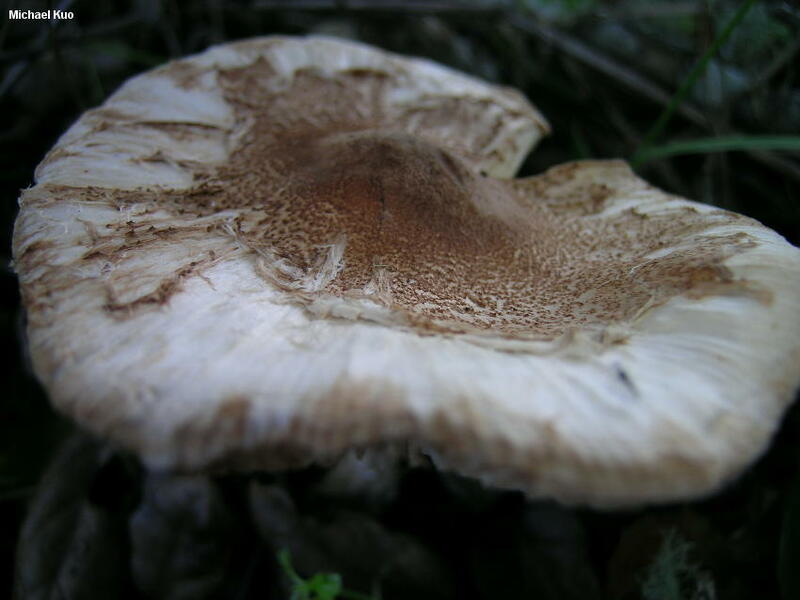 Gills: Free from the stem; close; short-gills present; white, becoming slightly brownish with age; at first covered by a thin, white partial veil. 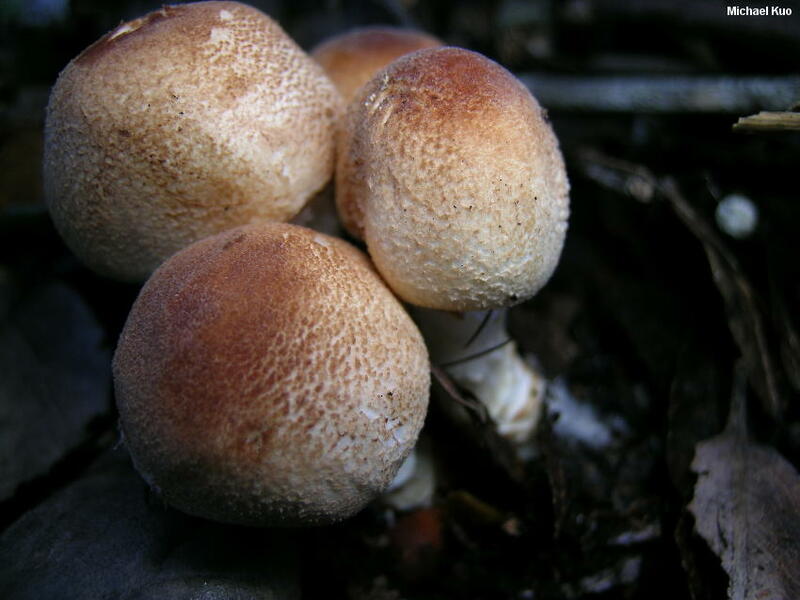 Stem: 4-9 cm long; 0.5-1.5 cm thick; more or less equal, with a slightly swollen base; bald near the apex; fibrillose to shaggy below; whitish to brownish; with a sheathing, white ring or ring zone that often disappears; basal mycelium white and copious. 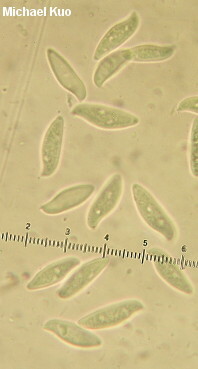 Microscopic Features: Spores 13-20 x 4-5 µ; fusiform, with a flattened abaxial side; smooth; hyaline in KOH; dextrinoid. Cheilocystidia inconspicuous and basidiole-like; clavate; to about 30 x 10. Pleurocystidia absent. Pileipellis a tangle of cylindric elements giving rise to areas of trichoderm; reddish brown in KOH; some elements clamped. REFERENCES: Murrill, 1912. (H. V. Smith, 1966; Vellinga, 2000, Vellinga, 2001a; Vellinga, 2003b; Desjardin, Wood & Stevens, 2015.) Herb. DBG ROMO-2012 5022-16, 5023-05, 5025-15. Herb. Kuo 01150604.